"I'm safer in Baghdad," Courtney Love tweets amid the chaos. 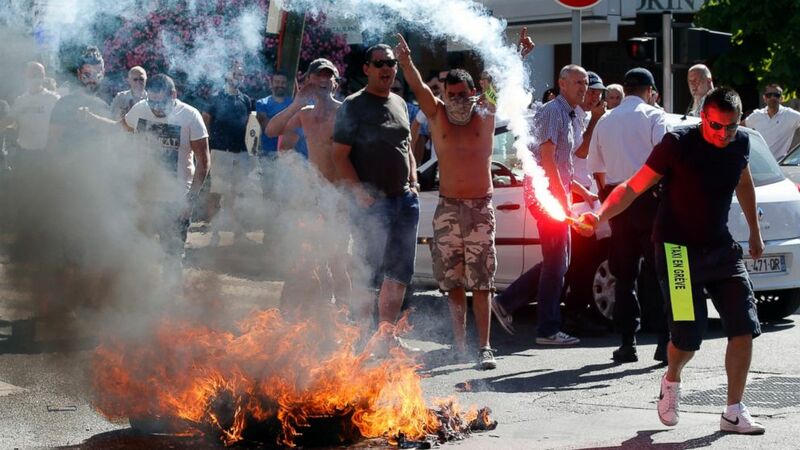 camera (Jean-Paul Pelissier/Reuters) Taxi drivers on strike burn tires during a national protest against car-sharing service Uber in Marseille, France, June 25, 2015. 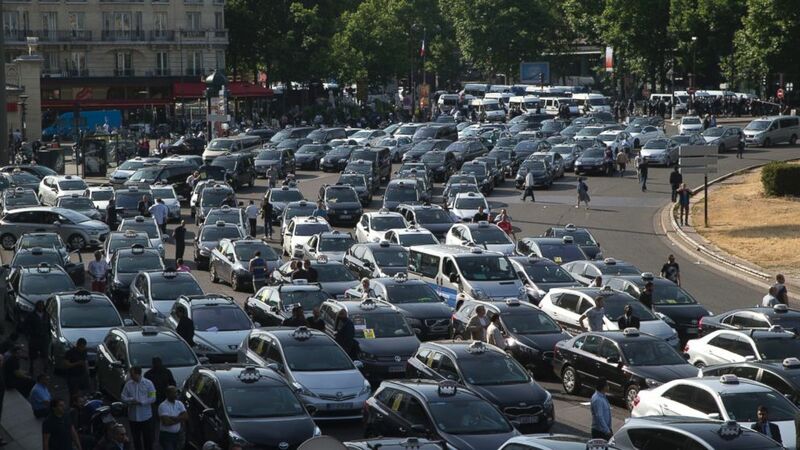 Paris officials announced a ban on UberPop after about 2,800 taxi drivers staged a strike across France today in protest of the ride-hailing app that resulted in numerous arrests and injured cops. The taxi drivers briefly blocking access to airports and forced passengers to finish the journey by foot. Some drivers vandalized several Uber cars, even flipping some over, and riot police were forced to intervene, arresting three taxi cab drivers, according to police officials. (Charles Platiau/Reuters) French taxi drivers, who are on strike, block the traffic on the Paris ring road during a national protest against car-sharing service Uber, in Paris, June 25, 2015. The demonstration was organized to protest against UberPop, the service that connects customers to drivers without professional taxi or chauffeur licenses. These drivers use their private vehicles to pick up clients, and UberPop is usually a second job for them. Prices for the UberPop version of the Uber app are generally 30 to 50 percent cheaper than cab fares and drivers pay far less taxes. The UberPop service had already been deemed illegal by the French government that accuses it of unfair competition, though the Uber app has not been officially banned. And today's action does not mean UberPop, and other services like it, will disappear but that police can arrest drivers in Paris and its suburbs using it, and also fine clients. But the thinking is that it will be difficult to enforce. 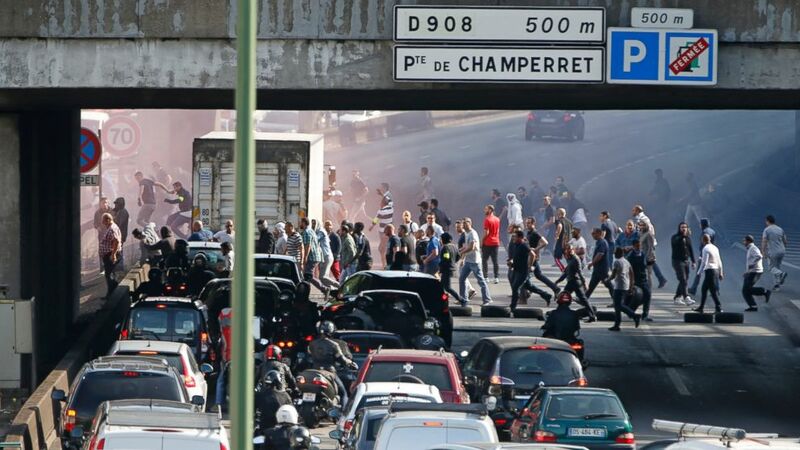 (Michel Euler/AP Photo) Taxis gather at a major entrance of Paris, June 25, 2015, in Paris. Thibaud Simphal, director of Uber France, said on French TV BFM Business that the company will challenge the "prefectoral order." "We will challenge it and see what comes out of the appeal, Uberpop can continue," Simphal said. The Interior minister announced that 10 people had been arrested and seven police officers injured, in addition to the 70 cars vandalized during the day. One of them appears to be shown in this YouTube video where a man on an overpass sends a rock crashing down on the windshield at Porte Maillot on the west side of Paris, where taxi drivers were demonstrating all day. Also, an Uber car transporting a couple and its baby was hit by a rock on the way to the airport, breaking the rear window. "It was very scary," the passenger told French TV station iTele, but no one was injured. Uber had warned earlier in the day that "demand will be very high today and the service could be disturbed. Good luck to all." At Orly airport, an Uber driver reportedly ran over a cabbie who was blocking off his car, injuring him. He has been taken into custody. Reacting to the clashes, Prime Minister Manuel Valls "condems with great severity" this "unacceptable" violence regarding today's events, he said. 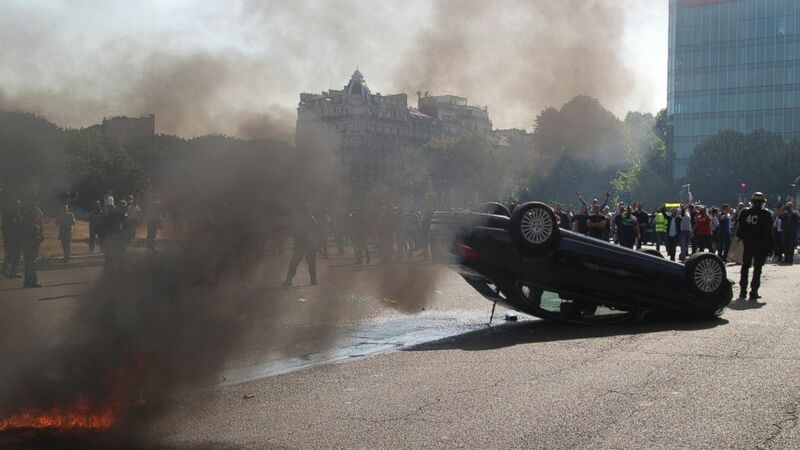 (Michel Euler/AP Photo) Striking taxi drivers stand behind an overthrown car during a taxi drivers demonstration, June 25, 2015, in Paris.